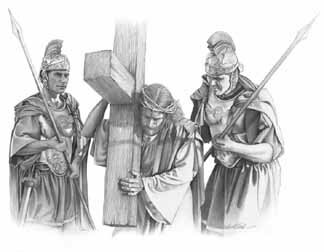 'The same sacrifice would be required,' said the voice of Him crucified. 'I cannot answer, for I am not certain that an adequate definition of wrong can be established,' bantered man, stepping aside to avoid the falling flecks of blood. 'Huh?' responded man, turning to leave. 'Look where it got You. Crucified! And for what? All this suffering for what?' And man, shrugging, turned his back to depart. A flash of lightening. A rumbling and roar of thunder. A last cry, 'It is accomplished!' Silence.